… and as for that other year: Good riddance. This entry was posted on December 31, 2016 at 11:59 pm and is filed under Cartooning. You can follow any responses to this entry through the RSS 2.0 feed. You can leave a response, or trackback from your own site. Ha. And ha again. 2017 is going to be great. Really great. Believe me, you’re gonna love it. You’ll love it so much, you’ll get sick of loving it. Sad! Weak! Get that sickie out of here! Boy, that sums up my view of 2016. Say it with ‘toons! Well aimed! My views also! Patrick, Is it ok for me to share this on my facebook page? Sure thing, Charley. The more the merrier, right? 2017 is going to be, believe me I’ve a smart brain I know things others don’t, bigly. 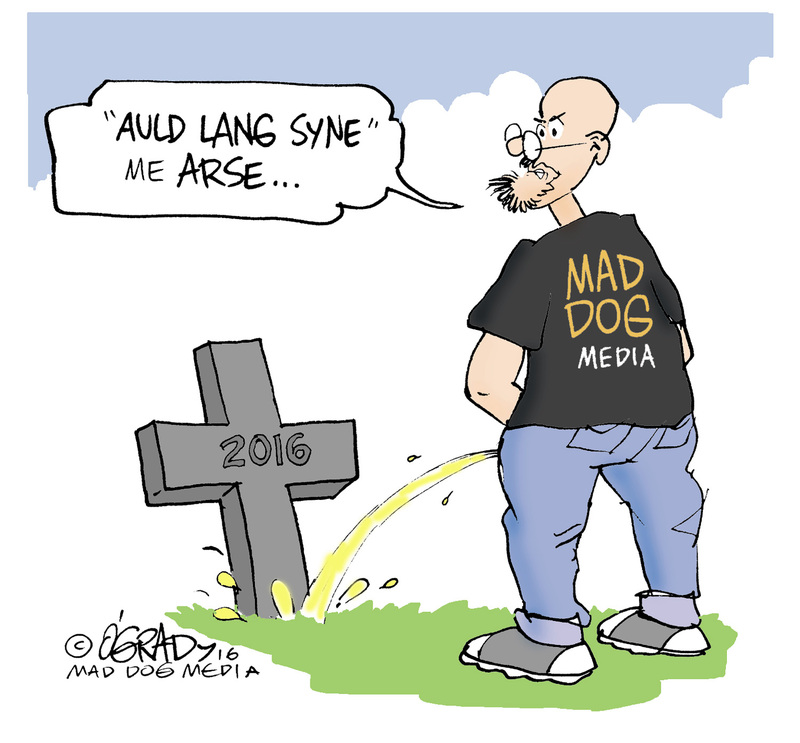 On a personal level, 2016 sucked, so yeah I’d pee on it’s grave too. Regardless of the political insanity in store for ’17, (which I am going to ignore as much as I can – I’m too old for this sh*t . . ) I will enjoy many biking adventures that the new year will bring. Happy New Year and happy riding everyone!